I knitted him last December, to feature in my son’s pirate adventures… and he landed on my table a while back somehow and… stayed! This morning, I got up, had a stretch and sat at the table to paint. It came to me straight away: I wanted to paint an octopus. And of course, all octopuses are like Kraken – purple! Then I started to imagine that this octopus was actually an undercover submarine, hence the human eyes… which are actually human spy eyes! I have always loved the sea and I have been trying to paint it for a very long time – ever since I first started playing with watercolours – ahem, a little while back. I still have sketchbooks from around 2004 full of blue pages – which were various attempts at painting the ocean. So whenever I mindlessly – or mindfully – pick up my paint box and brushes, I always start by spreading a lot of blue on the page, and add water. A lot of water. I just love painting the sea – or at least trying. Every attempt brings me closer, slowly but – hopefully – surely :) well, hopefully! I like the picture below because it shows three things I love to play with the most: wool, colours and water! And since I have finished the fair isle mandala hat yesterday… now what? Poseidon Tam, by Outi Kater – Photo by Outi Kater. Even though blue doesn’t really suit me that well (I have green eyes, so I can wear purple but blue doesn’t really work on me… ) I have always loved exploring and playing with it. I just can’t help it, I need to knit this hat! It’s visceral. Just like I need to paint the sea every day, splatting blue pain and water all over my sketchbooks. I absolutely love that hat! Gorgeous. The octopus painting is delightful. I’m sure I’ve probably told you that my youngest brother is nicknamed Octopus so we siblings are obsessed with spotting octopus things, taking photos of them and tagging him as them on Facebook. The result is that I’ve got a growing octopus obsession myself so I’m drawn to all things tentacled (already having a jellyfish obsession). Well I’m not sure I would be fond of swimming with them; I just think they are beautiful and fascinating. Your anecdote was something I could empathize with as I had a similar experience with eels in a river in Aberdeen. An individual eel wouldn’t bother me but a whole shoal of them pushing past me made me feel panicky and I’ve disliked them ever since. With your love of the ocean, I’m not surprised that hat appeals to you! 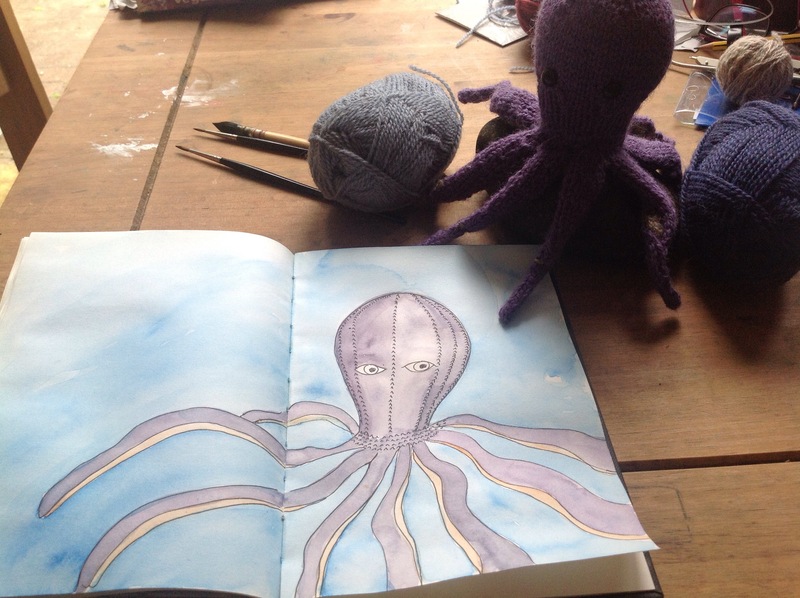 The pattern is gorgeous, and you could totally knit it in green and purple so it matches your colouring better 😀 Nice to see Kraken making an appearance on your blog again – he’s very sweet!